Best Western Seaport Inn of New York City. 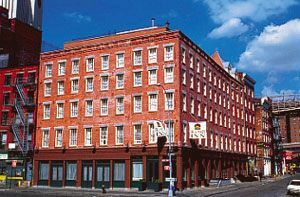 A nineteenth century country guesthouse right in the heart of downtown New York at the Best Western Seaport Inn. From the moment you enter the lobby, with its cozy seating and gracious elegance you will find yourself in a warm and comfortable refuge from the hustle and bustle of the city. We pride ourselves on old-fashioned hospitality and traditional values not found in the large impersonal city hotels in Manhattan. Now Featuring Complementary Hi-Speed Internet Access. We are centrally located near several tourist attractions, including the South Street Seaport, Pier 17, Battery Park, Statue of Liberty, National Museum of the American Indian, Museum of Jewish Heritage and Vietnam Veterans Memorial. We are located in the heart of New York City, within walking distance to the Financial District, Federal Reserve Bank of New York, New York Stock Exchange, Federal and United States Courthouses, Civil and Municipal Courthouses. Whether it's for business or pleasure, the Best Western Seaport Inn is your ideal lodging headquarters. This and other New York City Bed and Breakfast Inns can be found here online in The Register.